The threat to elephants due to the human-elephant conflict has become one of the most pressing conservation issues in wildlife management in Sri Lanka. Sri Lanka was home to about 20,000 elephants 100 years ago, which has now dwindled to about 5,000. Many elephants now live in densely-populated areas, because farms and plantations have expanded into their traditional homes. The annual toll is alarming, with around 200 to 250 elephant deaths, 60 to 90 human casualties due to elephant attacks and around Rs. 1.1 million in crop and property damages. The electric fences erected are not effective barriers, since the elephants are very smart, finding unique ways to overcome them. Pokunutenna is a village situated close to Hampegamuwa (Udawalawa-Thanamalwila road) where the main income of the villagers is from paddy farming. The village borders the Udawalawe National Park and the villagers face many difficulties due to the encroachment of wild elephants. Identifying this issue, the Business Banking, Administration, Middle Market, SME, Corporate Office and Marketing Departments of the bank embarked on a unique initiative to mitigate the human-elephant conflict in this village, through the Employee Volunteerism CSR Initiative of the bank. Under this CSR Initiative, the teams implemented a unique solution to this issue using a three pronged effort. This included the installation of an infra-red alarm system which operates as a warning to the villagers and also helps scare away the elephants without hurting them. This is the first time that this unique method has been used in Sri Lanka and the success of these efforts was evident the very same day it was fixed. Towards late evening the alarm was activated, signalling the encroachment of elephants; however unlike previous instances the elephants did not enter the village but turned back and returned to the jungle, causing no harm to the villagers or to themselves. In addition, the NDB volunteers also planted rows of citrus trees which would act as a natural fence preventing elephants from encroaching since elephants have a natural aversion to citrus. Bee-hives will also be installed which also acts as a deterrent to elephants encroaching. The infra-red system was installed by the maintenance team at NDB, who spent many days in the village volunteering their time and effort to uplift the community. The citrus trees were planted by the volunteers who also distributed citrus trees to the villagers, to be planted around the perimeter of their gardens. “The bank’s volunteers worked tirelessly to complete this project, interacting with the villagers, encouraging them and giving them hope. The villagers were also trained on how to operate the system. A qualified resource person was also engaged to train the villagers on bee keeping, which will give them an added income. The team will also link the villagers with buyers which will be a boost to their livelihoods. 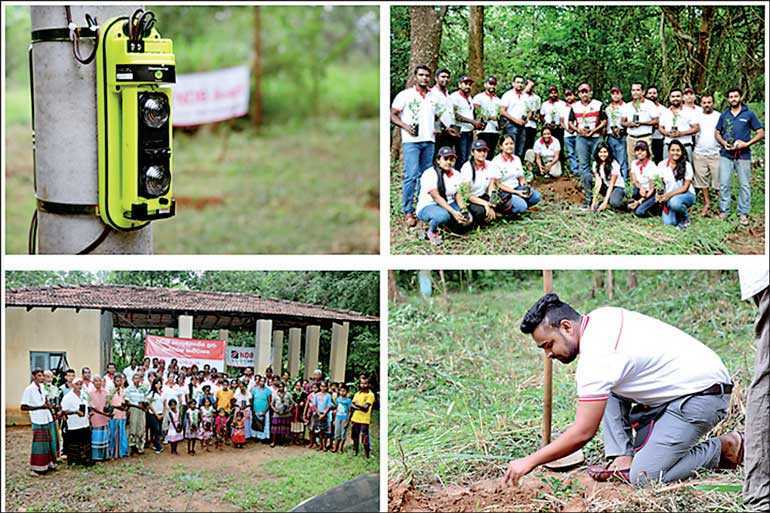 This project is unique in many ways and we at NDB are proud of our employees who sacrifice their time and efforts to give back to society,” said NDB Senior Manager Corporate Sustainability Sharon De Silva. As a responsible corporate citizen, NDB strives to make meaningful contributions to the society through its strategic sustainability initiatives that aim to inspire the sustainable growth of a progressive Sri Lanka. Sustainability is a strategic priority at NDB and the Bank continuously endeavours to foster it across all its business decisions and activities. NDB Bank is the parent company of the NDB Group, one of the fastest growing financial services conglomerates in Sri Lanka, with the strategic mission to be the dominant leader in the financial services and banking sector. From its inception, the group which includes NDB Bank, NDB Investment Banking, NDB Wealth, NDB Securities, and NDB Capital has been a catalyst in the development of the nation, strengthening and empowering entrepreneurs, corporates and individuals from all strata of the economy. Its customers across all group companies have benefited from the product and service offerings of the NDB group.